I recently had someone say to me that reducing something into its components does not always give you greater understanding. Certain things simply cannot be broken down since they are inherently complex. Sure, but you have to be very careful with this line of reasoning. This is the same reasoning that brought us “irreducible complexity“, “specific complexity“, and holism in general. These are excuses that are commonly given when someone is resisting the direction of the modern scientific evidence to hold on to their old beliefs. As with anything in science, you can’t just say, “It’s complicated. Leave it at that.” The next thing you know you’ll start saying things like, “The eye couldn’t have evolved through natural selection,” which is just ignorant. You still have to explore the why and the how of the complexity and you may find out that there is a lot of understanding to be had. Even the most complex system has component understanding. Trust me, I argue on the side of complex, emergent, non-linear dynamical systems all the time. They are a real thing, but a very specific thing with KNOWN INPUTS DAMMIT! I’ve also written about the never-ending complexity of “truth”. “Yes. It does. What’s your point?” I prod. I’m waiting for the old trope about hydrogen and oxygen to get dragged out. “But when you use either of its component parts in isolation, hydrogen or oxygen, to put out fire, they actually have the OPPOSITE effect! They INCREASE the fire! Breaking them into their components and testing them individually does not tell us what will happen when you put them together.” Check and mate! “Wow, that’s a good point, let me think for a bit. If your question is so superficial as to ask simply IF water will put out fire, your point is taken. Just test the water on fire (not a grease fire, of course). But if your point is that doing such testing does nothing to deepen our understanding as to WHY water puts out fire, then you are simply being obtuse or willfully ignorant. Do you know WHY water puts out fire? You’re damn right I am! Fire requires three things in order to come into existence: An energy source (heat, spark, or other catalyst), a fuel source (something to “burn”), and an oxygen source. For our purposes we will only focus on fuel and oxygen. To understand why it needs those two things, we first need to understand what fire actually is. Fire is simply the rapid and quite energetic oxidation of a fuel source. For our purposes “oxidize” simply means “combining with oxygen”*. Where fire is a rapid and energetic oxidation process, something like rusting is a very slow oxidation process (iron turns into iron oxide or “rust”). The unique qualities of fire itself (light, heat, etc) is just the energy that is released by the reduction-oxidation chemical reaction going on. So, in the case of typical fire, the oxidizer is the thing carrying oxygen. In this case that is, well, oxygen, typically from the atmosphere. The thing being oxidized is the fuel. The more easily a fuel source accepts oxygen (oxidizes), the more flammable it is. So let’s look at our components of water: Hydrogen and oxygen. Throw hydrogen on your fire, then throw oxygen. It turns out that these two things do not have the same effect on fire if you look beyond the similar flash of increased energy release. They have a similar result but through completely different mechanisms. Hydrogen affects only the fuel side. Oxygen only affects the oxygen side. Now, hopefully you can see how adding oxygen is adding to the oxygen side since it’s, uh, adding oxygen. If you were to compare the gases being released by the fire before and after you added the oxygen, there would be no difference. All you did was accelerate the process that was already happening. Hydrogen, on the other had adds an extremely receptive fuel source. Hydrogen is so ready to oxidize that it has a hard time existing in its pure state here on Earth. Now, in this situation, when we compare the gases being released by the fire before and after we added the hydrogen, we would find the presence of a substance that wasn’t there before. Oxidized hydrogen, AKA dihydrogen monoxide, AKA “water” in the form of water vapor (gaseous water). This actually gives us a clue as to WHY water puts out fire. It is the same reason that carbon dioxide (CO2) is also a pretty good option (throwing pure carbon dust on a fire would have a similar, albeit smaller, flare as throwing hydrogen on it). Water puts out fire by creating a barrier between the fuel source and the oxygen source (it also has a cooling effect which has to do with the energy required to convert liquid water into water vapor). It does this because it is a completely, 100% oxidized material. It simply cannot oxidize any further so it will not “burn”. This smothers the fire. The same thing would happen if you used the ashes that remained after a completely spent fire. Or, as I mentioned before, CO2. Of course this is why water doesn’t work on a grease fire. Since grease floats on water, the water cannot block the fuel (grease) from the oxidizer (air). So the point of this is that you CAN learn how water puts out fire by testing its component parts. It also gives you the understanding that allows you to know when and why water wouldn’t work (like a grease fire) or to find OTHER things that will do the same thing, since you now understand the mechanisms. P.S. to the pedants: Don’t come at me with “emergence”. That concept is still deterministic in nature and can be studied through reductionist experimentation of the components to achieve a deeper understanding of their interplay and how manipulating those inputs at different intensities can affect the system as a whole even if the prediction is imperfect. Go ask a meteorologist. In the example above, one could say that fire is what “emerges” out of heat, fuel, and oxygen – but you still learn by studying the components. Also don’t try to out-pedant a pedant! *If you want to get technical, “oxidize” actually means to remove an electron. When hydrogen becomes oxidized, it loses an electron, ionizing it into a cation. The thing that stole the electron (often oxygen) becomes “reduced” and ionizes into an anion. The two ions then merge to become a new molecule. 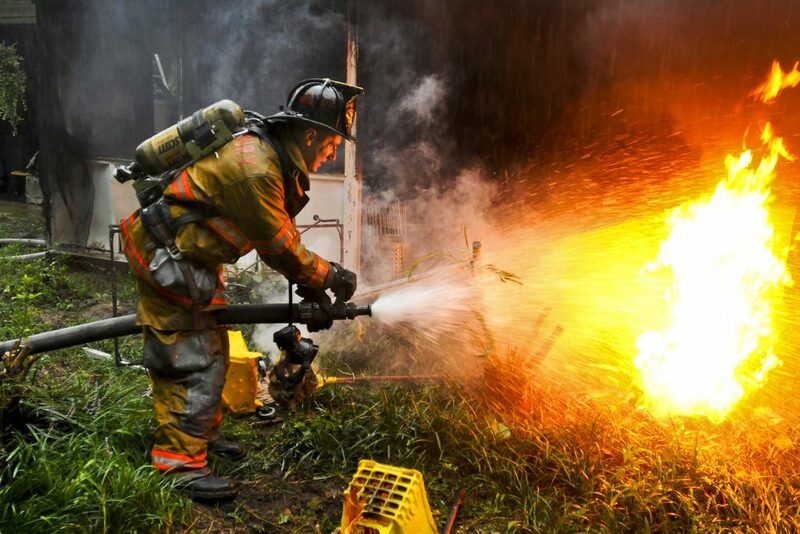 The featured image on this post is “Putting out fires” by The U.S. Army via Flicker. 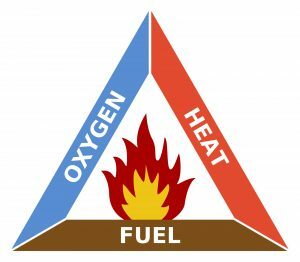 The Fire Triangle is from Wikicommons.